Everyone has spiked hair in the future. Sorry Locke! Future Ence doesn’t actually think you’re dumb, he’s just trying to be funny and give you a hard time. Probably. 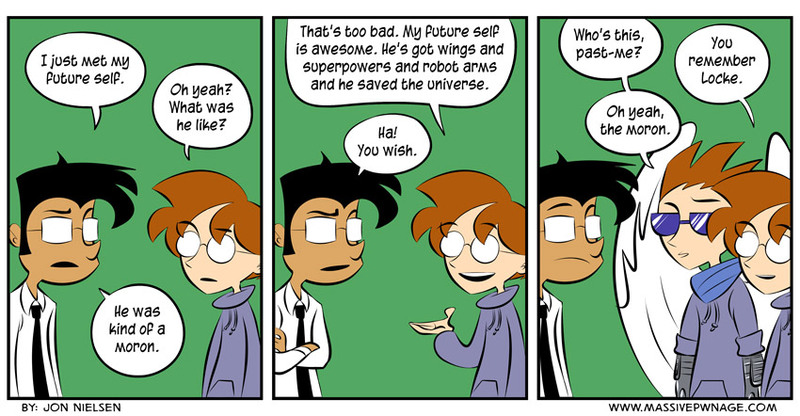 This entry was posted on Wednesday, September 18th, 2013 at 12:00 am and is filed under Comics. You can follow any responses to this entry through the RSS 2.0 feed. Both comments and pings are currently closed. Well, to be fair to Future Ence, even Locke called Future Locke a moron. Maybe that’s who Future Ence was thinking of. I just noticed that this comic didn’t have a textured background, I was wondering why it seemed to look different from the other ones.